Mom's Gone Bronson! : Get Behind the GlowCicle™ Kickstarter for Party Fun and Bright Light's on Dark Nights! 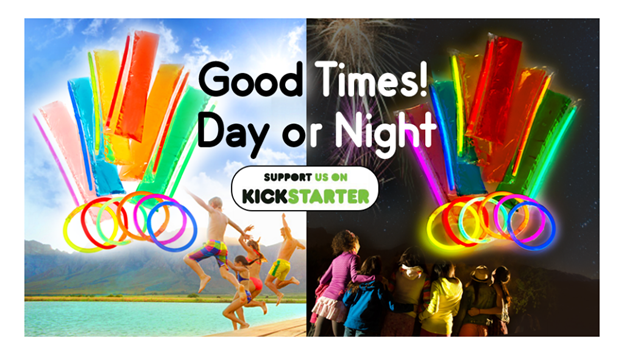 Get Behind the GlowCicle™ Kickstarter for Party Fun and Bright Light's on Dark Nights! Disclaimer: I am not being monetarily compensated for this post and will not benefit from any funds provided to this project. Thank you! If this isn't the most fun idea I have seen in a while, then I do not know what is! Check out these all-natural GlowCicle™ frozen treats, which are ice pops, in a variety of colors, with a pouch at the side to hold a glow stick, which in turn then lights up the GlowCicle™ and makes a fun party even better with a little twist that some guests might not have been expecting!! Fun for dark nights out, late nights in and any time of day, these glow sticks can be used for bracelets or put together for necklaces so you can carry on the fun a while after the ice pop is gone and until the glow stick runs its course! And guess what? All of these differently colored ice pops are the SAME flavor, but it is thought that some people taste different flavors based on what they think they should taste like after glancing at the color, which makes for a great conversation and a good giggle when you realize that they are all made of the same stuff! Right now, there is a kickstarter campaign to get these out to the masses and so if you want to see them near you, head on over and see what you can do, or just to share your thoughts on the idea, too! The campaign will run for just 40 days and is active, right now, so check them out, today and watch for my up-coming review when recieve mine in the mail in a week or so! !